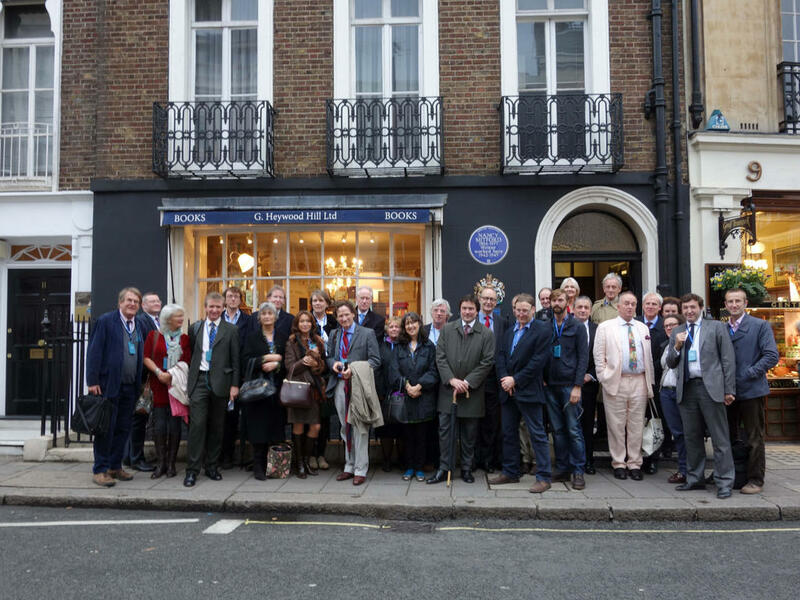 To celebrate the publication of Artemis Cooper’s biography of travel writer Patrick Leigh Fermor, Today presenter James Naughtie joined a party led by Artemis Cooper to walk past some of Patrick Leigh Fermor’s London haunts. As you may see from the photograph, the participants included Colin Thubron, Cherie Lunghi, Justin Marozzi, Robert Macfarlane, and Gabriella Bullock who is “Billy” Moss’ daughter. Starting at Paddy’s favourite bookshop (and temporary post-war residence) Heywood Hill, we first braved the traffic in Curzon Street to cross into Shepherd Market where curious drinkers at The Grapes watched as we gazed in awe at 28 Shepherd Market, the place from where Paddy set out on his walk on 8 December 1933. It may have been bombed in the war as the building is a replacement with the enticing Plus News newsagent on the ground floor. 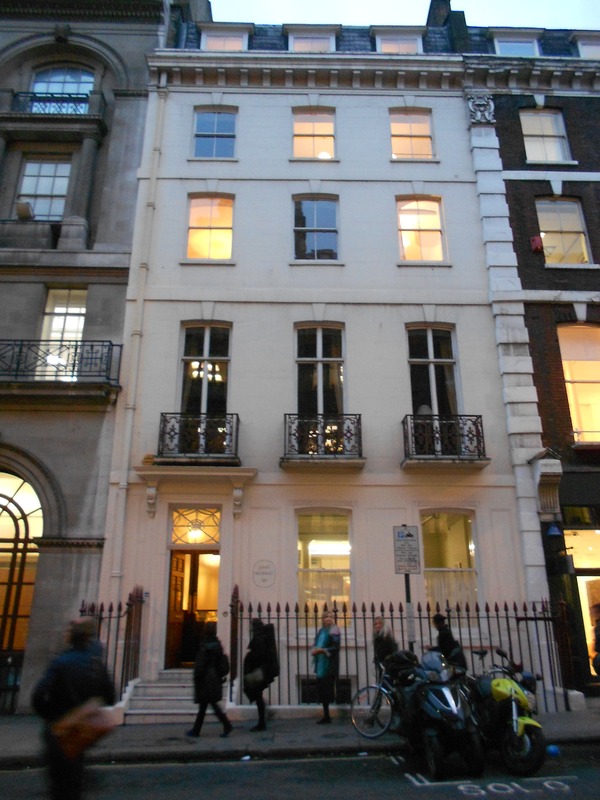 We weaved our way in the dusk to Berkeley Square which Paddy passed through one night during the blitz and later noted ‘only one thing remained standing, three storeys high, stood a white marble privvy’. The journey to Stratton Street was quick and this is where Paddy left two trunks containing most of his documents from the walk which were eventually deposited by the keeper into Harrod’s Depository; Paddy could not pay the large accumulated storage fee and when he did return the trunks and their contents had been sold and dispersed. Artemis observed that perhaps it was a good thing as he had to rely upon his mind and was perhaps ‘set free’. Our touristic snake trailed into Albemarle Street and we passed John Murray’s at number 50, crossed Piccadilly to the entrance of The Ritz where Paddy often stayed, but once had great difficulty entering when in training at the Guards’ Depot as he was dressed in the uniform of a private soldier, the Ritz being for officers only. Paddy went to riotous and notorious parties at The Cavendish hotel in Duke Street, St James’ with many of the “bright young things” which did not include Evelyn Waugh as he had offended the owner, Mrs Lewis who said of him ‘When I see that Mr Waugh I’m going to cut his winkle orf’. Mrs Lewis indulged Paddy and others of somewhat straightened means and let them build up virtually unlimited credit. She knew that they would be unable to pay, but it was small beer to some of her more wealthy clients who did not check their bills too closely and ended up paying for Paddy’s extravagancies. Throughout the walk we were accompanied by James Naughtie from Radio 4’s Today programme. He recorded the package below and left early as you would expect from someone who has to get up at about 3.30 am when presenting the programme. 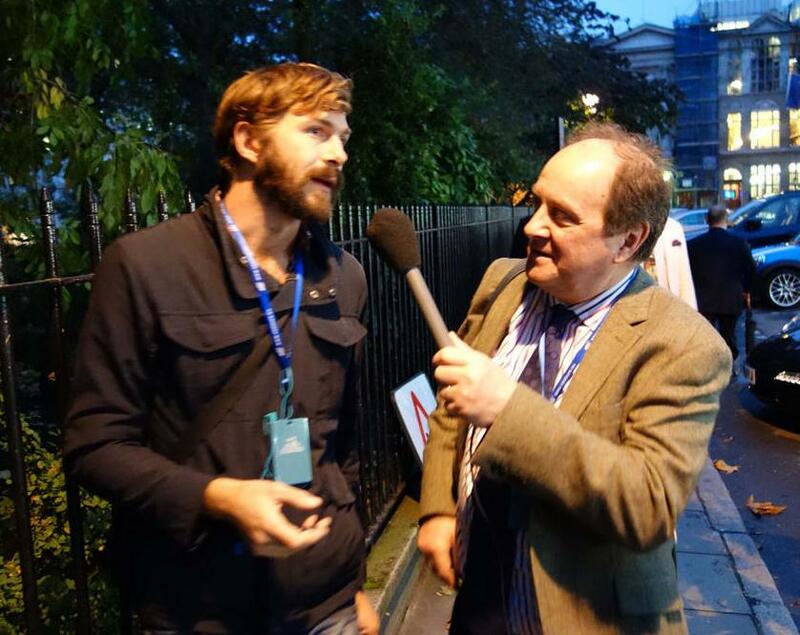 Naughtie grabbed some time with Nick Hunt who walked Paddy’s route from Hook of Holland to Constantinople just this year. He promised to make Nick a star. Let’s hope so. 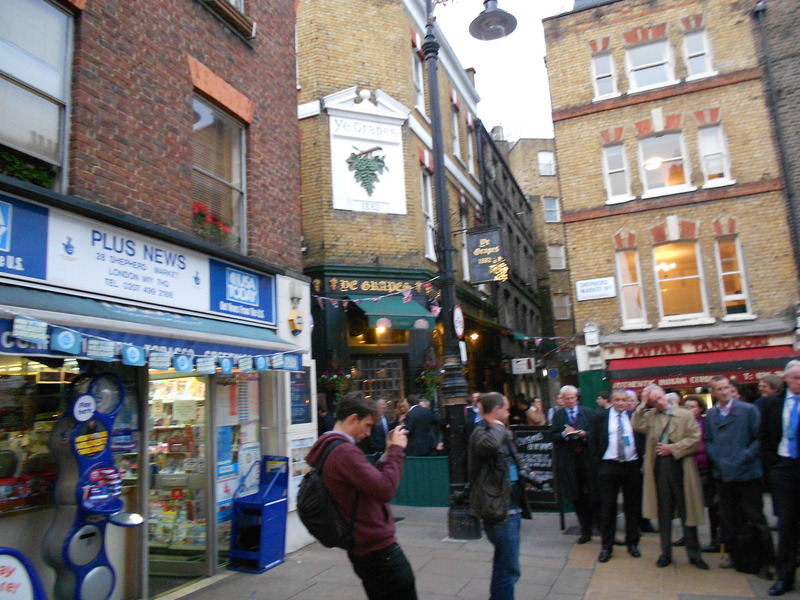 This tour through Paddy’s Mayfair was a pre-cursor to the official launch of Patrick Leigh Fermor: An Adventure at Paddy’s old club, The Travellers. Artemis got a very well deserved round of applause for the biography, and she spent most of the evening busy signing books; dozens must have been sold. Ian Hislop made a sartorially unkempt appearance near the end (how did he get in without a tie? 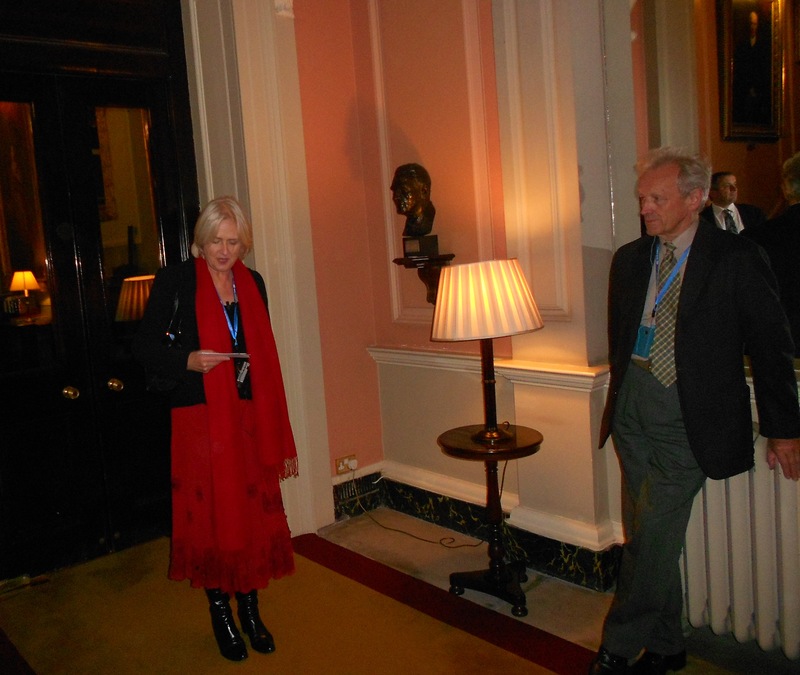 ), and I think I saw Bank of England Governor, Sir Mervyn King pop in and do his bit for the consumer economy. This entry was posted in An Adventure: Paddy's Biography by Artemis Cooper, In Paddy's Footsteps, Paddy's Friends and tagged An Adventure, Artemis Cooper, Cherie Lunghi, Colin Thubron, Ian Hislop, Nick Hunt, Patrick Leigh Fermor, Sir Mervyn King, Travellers Club on October 18, 2012 by proverbs6to10. Good show; Slightly smallish bust, though?? HA HA HA HA isn’t he something else? great stuff! 🙂 by the way, I just got the book and started reading… brilliant!